From 1–11 to 13–0, P.J. Fleck has transformed WMU, and the CFP committee should do right by the Broncos by giving them a crack at the sport's upper echelon in the Cotton Bowl. DETROIT — O.K., so now as we prepare for Endless Recrimination season to begin in college football, let’s all remember that, at the game’s top level, there are only two undefeated teams. One of them is coached by Nick Saban, who is grim and spleenful the way Melville described it, dank, drizzly November of the soul and all, and who, along with Bill Belichick, has turned grumpy genius into performance art. The other one is coached by P. J. Fleck, who is none of those things but who, instead, apparently was replaced at birth with a very human-like breeder reactor. “We’re not perfect. We’re not perfect people. We’re not a perfect football team. We’re very real,” Fleck said, after his Western Michigan team finally put away a very stubborn Ohio University team, 29–23, to win the MAC championship and finish the regular season at 13–0. “But it’s historic. It’s wonderful for the city of Kalamazoo that’s had a very tough year, with the shootings and the bicycle accidents. If we can provide energy and hope, for just a little bit, and give them and their families some type of relief, to get away from what they’re thinking about every single day, we did our job. “I told you before, I’m not a head football coach to win. I’m here to produce win-ners, and I’m here to affect communities and serve the game as much as we can. That’s what our players have done all year. That’s why they’re a champion. Not because we have the best players. Not because we have the best coaches. Not because we have the best facilities. It’s truly because we have the best people. And it just goes to show the power of people. They were crazy enough to hire me, and then from there, I got people who were crazy enough to coach for me, and then we found players crazy enough to play for them and me, and to believe in this row-the-boat vision. And we’ve come a long way. Again, it’s for our community. It’s for the ’66 team, for the ’88 team, the ’16 team, past Broncos, current Broncos, future Broncos. “Agreed!” someone yelled from the back of the room. And that’s what this weekend is really all about. While the power conferences are holding their annual fundraising spectaculars in Atlanta and Indianapolis, and parceling out who will be permitted to play for the national championship, Western Michigan plays in one of what is called the Group of Five conferences, which are allowed into the glamorous world of the postseason through the door reserved for the kitchen help. Western Michigan is 13–0 and, if it’s lucky, will have a shot to play in the Cotton Bowl. That's a long-time New Year’s Day classic that is part of the College Football Playoff rotation now. However, this year is not the Cotton Bowl's turn to host one of semifinals or the final (it had Alabama-Michigan State in the semifinals last season). The smart money says that, should Navy beat Temple on Saturday, and then Army a week later, the Middies would have a shot at acing Western Michigan out of a trip to Dallas. The AAC and MAC, in which Navy and WMU play, respectively, are two of the Group of Five and, barring an unforeseen Boise Statement, non-playoff games like this season's Cotton Bowl are likely as good as it will get for those folks. On the next Ohio possession, Frank Solich replaced Quentin Maxwell, his freshman starting quarterback, with senior Greg Windham. Solich immediately became coach of the minute when Windham threw his first pass 67 yards to Papi White to set up Ohio’s first score. WMU piled up a 23–7 halftime lead, but Ohio remained just stout enough on defense to stay close. After Butch Hampton’s fifth field goal put the Broncos ahead with 1:24 to play, Windham got cranked up again, completing three passes in a row to put Ohio on the Western Michigan 37-yard line. With 51 seconds left, Windham looked for a receiver coming across the formation. He didn’t see Bronco linebacker Robert Spillane. “I just didn’t see the ‘backer,” Windham said. “That was a real good play by that guy. He read my eyes out there. I did a bad job with my eyes. I locked in right away on him because I thought it was there. So that was a mental mistake on my part and it cost us the game.” Spillane, on the other hand, reacted in keeping with his coach’s messianic vision that has taken Western Michigan from Fleck’s dismal first season to 13–0 this year. Fleck was struck by another thought. (He gets struck by thoughts the way some people get caught in hailstorms.) “But the emotions were up and down,” he said. “I just believe in this team. I knew that they would find a way to win this football game. Now, three years ago, we would have found a way to lose the football game. To be entirely fair, though, there is more than one good reason to hope the committee does right by one of the nation’s two undefeated teams. Fleck on a national stage is reason enough, but there’s also Corey Davis, who is simply too fast for the track he plays on. He is a feature film waiting to happen—a poor kid from a troubled home who moved in with the family of one of his lifelong teammates. It found him a personal tutor who drove Davis to improve his grades and test scores to the point where he’d be eligible to play football anywhere. Now, as a senior, Davis is a bonafide star, slated to go no lower than the high second round in next year’s NFL draft, and the receiver with the most total yards in FBS history. He’d also scored 50 touchdowns before last night, and his 51st was a definite keeper. With eight minutes left in the second quarter, Ohio had just scored to cut the Broncos’ lead to 9–7. On the first play from scrimmage, Zach Terrell found Davis crossing from right to left. Davis first beat all the Ohio defenders to the sideline, and then he beat all the Ohio defenders down the left sideline to score from 70 yards away, a touchdown that did a lot to settle down the jumpy Western Michigan offense which clearly was frustrated at having to settle for field goals three times in a row. Davis has been here for almost the whole ride. He was around for Fleck’s 1–11 debut in Kalamazoo, which was enlivened on the Internet by a Fire Fleck thread on a Bronco message board that popped up after Fleck’s first game. 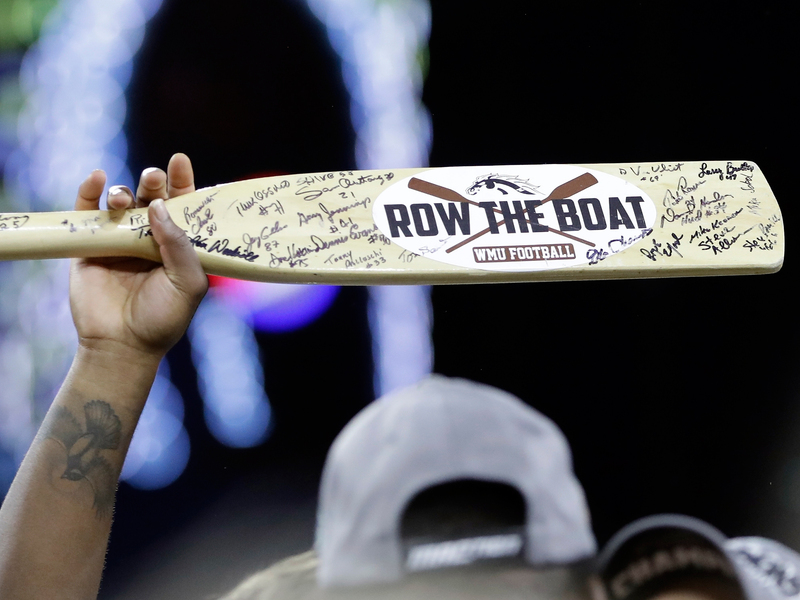 He has watched as Fleck has grown a winning program—identified now by its mysterious slogan, “Row The Boat”—and now, he has seen his talent blossom as the program turned around marvelously all around him, with one more game to play. Somewhere. Corey Davis needs a big room. His team deserves a big room. And his coach will make a big room out of anything if you let him talk long enough.